Already in the previous entry we talked about a very simple distortion design, but now we aim for a level of simplicity that can’t really be beaten. It is an own drdFX design, inspired by the Earthquaker Devices’ Bellows fuzz. I was searching for some good fuzz for bass that doesn’t eat up all my lows and has just a little bit of distortion to make the basic sound a tad more hairy. I found the EQD Bellows at the time and tried it with bass. I saw the potential, however the lows were massively lost and it had just too much gain. So I started modding the circuit until the drdFX Operation Fuzz was born. Besides the standard Fuzz and Volume controls there is a three way switch that controls the three levels of distortion (SNAFU, TARFU and FUBAR – look these up on google). 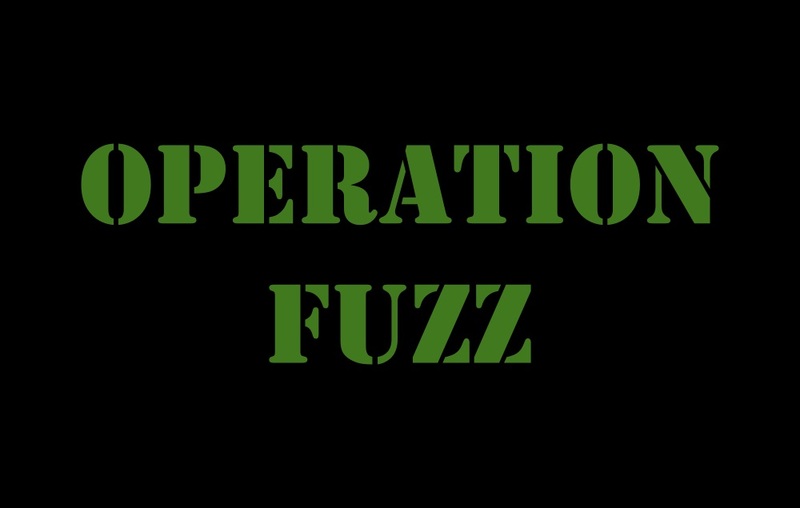 My favourite is the SNAFU level with the Fuzz pot at about 11 o’clock and the Volume at about 1 o’clock. With this I could give that extra grunt and agressiveness to my precision bass that I was looking for, emulating a slightly overdriven amp. 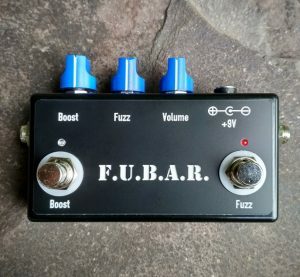 With some modifications the pedal can be used for guitar as well, however without the mods one might find the lows less defined and focused, a bit “flabby”. On the picture there is an early version with only the fixed SNAFU setting and an added bost. I built it for our bass player. The effect is still named here FUBAR, but this predates the idea of having the distortion type switch. The circuit couldn’t be more simple than this: at the input there is a voltage divider as the Fuzz control. It is followed by a decoupling cap and then a simple common emitter transistor stage. 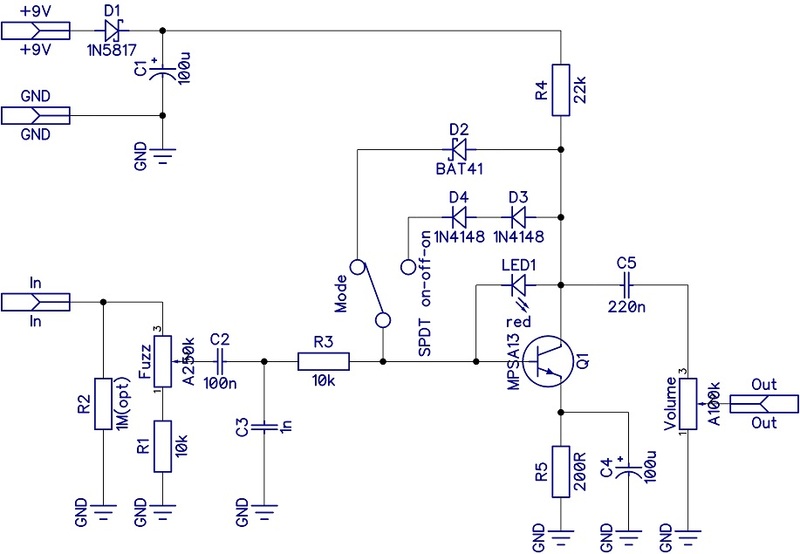 This stage has an added feedback loop with a diode in it, this diode does the actual clipping of the signal. 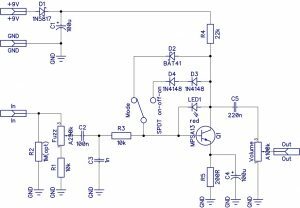 The three way switch controls the type of the diode: the lowest level of clipping is provided by a LED (SNAFU), the middle level is done by two 1N4148s in series (TARFU) and finally the highest level of clipping is achieved with a BAT41 schottky diode (FUBAR). After the output decoupling cap there is the final divider that serves as the Volume control. If you have only a two way switch at hand I’d advise to use the LED and BAT41 options only, the 1N4148s don’t differ much from the schottky. If you intend to use the effect for guitar I’d suggest lowering the input and output decoupling caps (C2 and C5), in the EQD Bellows these are 22nF (C2) and 68nF (C5), these can be a good starting point. The build documentation can be found under the Projects menu.